Thinking at new emerging technologies, we found a great idea which will be presented in December at SIGGRAPH Asia 2011, Hong Kong which is named Throwable Panoramic Ball Camera. As you probably guessed from its name, it’s about a built-in ball camera that captures a full spherical panorama when thrown into the air. Smartphones are great for snapping pictures, but what if you want the shot from more than one angle? Well, if you want to take panoramic photos, Jonas Pfeil has the solution for you. 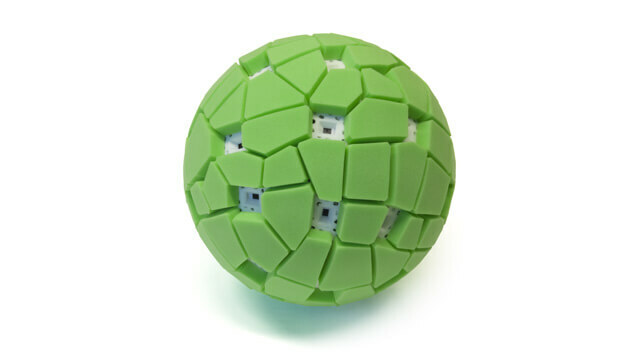 Created for his graduate thesis at TU Berlin last year, Throwable Panoramic Ball Camera wants to solve that problems that you encounter when you want to make panoramic photos. The unit uses 36 2-megapixel cell phone camera modules mounted in a padded sphere to snap a 360-degree panorama. This interesting camera contains an accelerometer which is used to measure launch acceleration. Just throw it up and once it reaches its highest point, all 36 cameras take a picture and all you need to do is catch it. After catching the ball camera, you can download the pictures in seconds using USB and you can see them automatically in its spherical panoramic viewer. This feature lets users interactively explore a full representation of the captured environment. In this moment, the product isn’t available because Jonas Pfeil and his team (Kristian Hildebrand, Carsten Gremzow, Bernd Bickel and Marc Alexa) are currently looking for an investor or a partner to build the camera. They will make an announcement when the camera is deliverable.